As I watched the HKonJ march in Raleigh today, I marveled at the impact black women had on the crowd. I see you as the foundation of the moral movement. Your presence, passion, and integrity set a high bar for political activism. You are the difference that needs to be made in 2018. Twelve years ago, I wrote an essay entitled Dear women, where I appealed to the women of the world to please take over. Today, I’m specifically asking that of black women. I'm hoping there will be some live-streaming of the march today. If it happens, you'll be able to find it here. The North Carolina NAACP’s biggest march of the year returns Saturday amid a bitter political climate that’s resulted in large protests almost weekly. 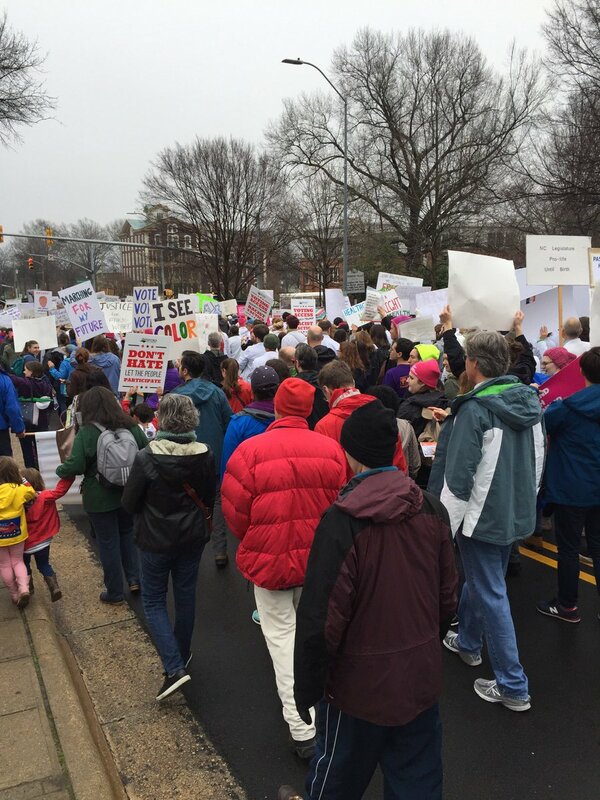 The Moral March on Raleigh and HKonJ People’s Assembly is now in its 11th year, and if the crowds at the recent Women’s March and other events are any indication, it could draw a record crowd. Barber criticized Sen. Bob Rucho and Rep. David Lewis – the Republicans leading redistricting efforts – for saying the court is creating “chaos” in this year’s elections because it ruled after absentee voting began. Aside from the racial aspects of the GOP packing more African-American voters into their already safe majority-minority districts, there is still the question of suborning the will of the voters. In 2014, Dem Congressional candidates garnered 44% of the vote (it would have been higher if not for allowing Pittenger to waltz back into office), but they only received 23% of the seats. Let that sink in. Under Dem redistricting, Republicans seats won and total vote count were not far removed from each other. And as such, the voters were much better represented. But when you have the appetite for power the GOP has, those considerations no longer matter.